can't remember which of Mark Driscoll's LLCs in WA has an expiration date at the end of this month? There's the book about which some controversy swirled over not just Result Source but why Mark and Grace Driscoll didn't give a nod to Dan Allender's work (and that of, well, a few other people) in the first print edition of the book. That editors went back and fixed the various lapses could seem to confirm that the initial problem of the Driscoll's failing to acknowledge Dan Allender's work even once was accurately assessed. Now, the book is copyrighted to On Mission, LLC, one of a few LLCs associated with Mark Driscoll. Let's look up the stuff about that again, shall we? So the members are Lasting Legacy LLC and OMCRU Investments LLC. It didn't always used to be that way, did it? That there was even a side company at all to manage the royalties and intellectual property of Mark Driscoll flew in the face of his 2009 sermon from the 1 & 2 Peter series where he said he didn't start a side company. So, at the end of this month one of the LLCs connected to the ownership of the copyright of Real Marriage expires. Let's bear in mind that Sutton Turner signed the Result Source contract on behalf of Mars Hill but the invoice was sent to Mark Driscoll as an individual care of Mars Hill. Even though an entire sermon series at Mars Hill was built upon the foundation of Real Marriage and Sutton Turner signed the contract, it was to promote a book that was copyrighted to Mark Driscoll by way of an LLC that stopped featuring Driscoll as a direct member some time after the LLC was created, to be replaced with membership via mediation of membership in other LLCs. But since one of the LLCs will be expiring in, oh, just a few days, it's worth revisiting the topic again. •The plan was poor stewardship. •If the plan were to be revealed, it would look poorly on the stewardship of Mars Hill Church. •If the plan were to be revealed, it would look poorly on Pastor Mark Driscoll. To date Turner has not explained why he had to be the one to sign the contract. He would not have been the highest ranking officer ... although in the wake of Munson's resignation he could have been the highest ranking employee in the organization. But under Munson's bylaws (or Driscoll's, we've discussed the ambiguity of whose creation the 2007 bylaws ultimately was over here earlier this week) if Munson resigned as president the vice president was the preaching pastor, Mark Driscoll. Still, there's a sense in which we should remember that Turner describes himself as willing to comply with policies he disagreed with. So in a sense while his name will always be attached to the Result Source Contract we should move forward a bit. Conspicuous for the moment by absence is mention of Mark Driscoll. Whether this omission indicates anything is impossible to say but toward the end of giving Turner at least some benefit of a doubt let's observe the following--in a way what matters is not so much that Turner signed the contract (though, of course, that matters), what matters is who was invoiced for that contract? By Turner's account there was a party or a group within the Mars Hill Board of Advisors and Accountability that was willing and supportive of the idea of letting Sutton Turner alone be the fall guy for controversy surrounding Result Source and Mars Hill Global. Turner also recounts that this split the BoAA and that some objected to this idea. Well, thanks to the reporting we've had access to in the last two years there's a very simple reason why we can accept this account as at least plausible. 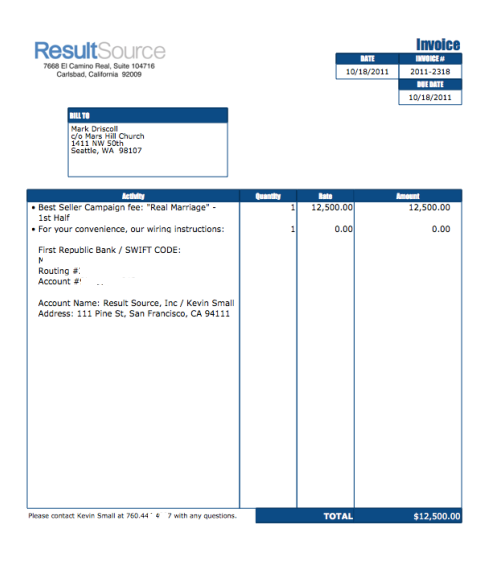 Mars Hill BoAA members would have known that regardless of whether or not Sutton Turner's name was on that contract, the invoices Result Source sent were to Mark Driscoll. There might be those who would read skeptically everything Turner has published in the last week. That's understandable but so far, at least, while Turner's account seems to uncritically accept some "history" of MH governance that has been disproven years ago, Wenatchee The Hatchet's current impression is that Turner may have simply repeated the history of Mars Hill governance ("everybody had to all agree for anything to get done) that was told him when he arrived. In that case he was told a basically false story he was not in a position to have corrected. And since between the 2007 post-trial statements and Mark Driscoll's "Stepping Up" video we can't be quite sure if Jamie Munson wrote the bylaws or Mark Driscoll wrote the bylaws that were approved in 2007, Sutton Turner's story has at least remained consistent on the essential details. What's more, Turner's account also squares with documents leaked from Mars Hill to Warren Throckmorton. Now if people dispute the accuracy of what Turner has said they should set the record straight. At the moment it seems as though Turner's recent account of a split in the BoAA in which some part of the group wanted to scapegoat him seems to reinforce the validity of Paul Tripp's statement that the BoAA was incapable of providing the kind of accountability it was designed to do. How would a BoAA split on the issue of whether or not to make the guy who signed a contract on behalf of Mars Hill to rig a #1 spot on the NYT bestseller list for Mark Driscoll a scapegoat be able to hold Mars Hill leadership accountable? As Paul Tripp stated last year about the BoAA, the most such a board could do was ensure financially restrained decisions, it could not meaningfully provide any other accountability. Turner's account says "some men", meaning Turner's understanding was there was more than one man on the Mars Hill Board of Advisors and Accountability who wanted to basically scapegoat him over Result Source. That's quite a claim. 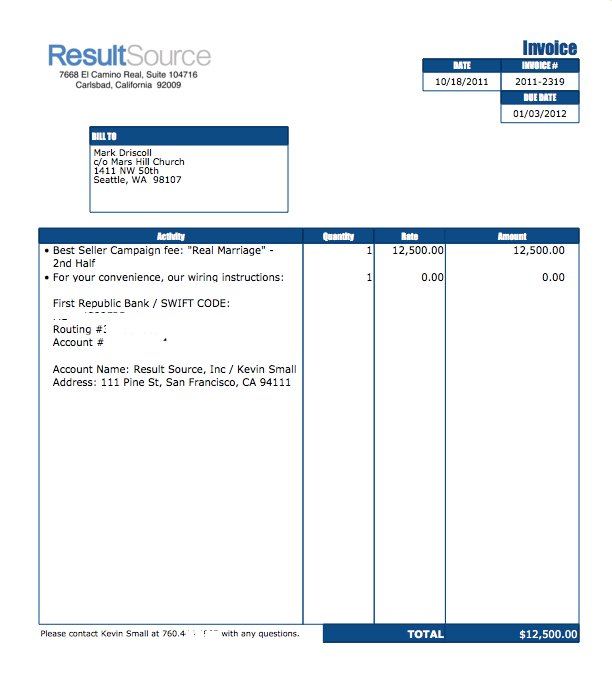 We can work out from the invoices of Result Source being sent to Mark Driscoll that those who opposed the scapegoat gambit could have done so on the basis of the fact that while Sutton Turner signed the RSI contract as a Mars Hill employee it was done to promote one of Mark Driscoll's books and Mark Driscoll had become the legal president of the organization. As we've discussed at some length earlier this week, when the plagiarism scandal erupted and Janet Mefferd presented evidence that the Trial study guide infringed on a copyright the initial Mars Hill public response was to spread the blame on to a team of research assistants for an introductory essay that only had Mark Driscoll's name on it. Which is to say, as scapegoating the employed help goes, there seems to be some precedent for this having been done before in the face of controversy. Turner's story may yet get rebutted from elsewhere but for the moment what Turner has shared seems plausible (if incomplete) and would even fit what has demonstrably happened in the past when Mars Hill has reacted to public controversy. If anyone previously or currently associated with the Mars Hill Board of Advisors and Accountability wants to clarify or correct any of the statements Sutton Turner has lately made now might be a good time. The most notable excerpts are quoted in blue, but you can (and may wish to) read the whole thing. As Throckmorton has noted in a blog post discussing other details of the recent Turner post, there's some striking statements in it. There was actually a division on the Board of Advisors and Accountability (BOAA) as some men wanted to put all the blame for both Global and ResultSource on me, but I am thankful for men who did not allow that. What could possibly be the problem with releasing the numbers? How are Mars Hill Church’s former attorneys (plural?) even players at this point? That there was internal division within the BoAA as to whether Turner should have been made the solitary scapegoat for whatever the scandal was for both Mars Hill Global and ResultSource is pretty amazing. Mars Hill had historically presented the idea that the elders were all in agreement. This could at various times turn out to not even be true but the illusion of unity could be important.Turner seems to have lifted the curtain a bit to show that in the midst of the RSI and Global controversies the BoAA split on the possibility of scapegoating Turner. Turner has also indicated Mars Hill's former attorneys contacted him to ask that he not post more and take down what he's already posted. What for is a mystery, and why Mars Hill's former attorneys even have any interest or business in making such an overture is also mysterious. If they are NO LONGER Mars Hill's attorney's anyway whose attorney's are they that they should even care whether or not Turner would publish the financials associated with Mars Hill Global? On what basis could the as yet unidentified attorneys even have for discouraging Turner from presenting for public consideration what numbers were involved? For those who may not remember what Wenatchee The Hatchet has had to say about Global, it seems the simplest way to clear everything up would be to just make the entire ledger of where every penny went available for public consideration. It's not so much "good people have nothing to hide" because everybody has something they'd at least rather not advertise, it's that doubt about Global was substantial enough that restoring trust would seem to be best served by 100% financial transparency, or so it would seem to Wenatchee The Hatchet. But it looks like we won't be presented any of the numbers associated with Mars Hill Global/Go, or whatever it's called now.